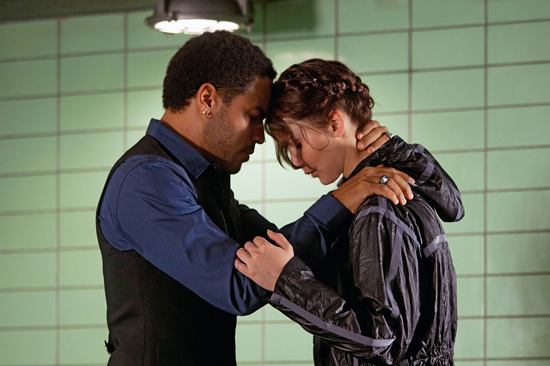 Lionsgate Release Intense New "Countdown Event" TV Spot for 'THE HUNGER GAMES'! Lionsgate have released a new Countdown Event TV spot for the studios highly-anticipated adaptation of Suzanne Collins' best-selling novel The Hunger Games, which arrives in theaters & IMAX next Friday, March 23rd. The movie, directed by Gary Ross stars Jennifer Lawrence, Josh Hutcherson, Liam Hemsworth, Woody Harrelson, Elizabeth Banks, Lenny Kravitz, Wes Bentley, Toby Jones, Alexander Ludwig, Isabelle Fuhrman, Amandla Stenberg, Stanley Tucci & Donald Sutherland. Hit the jump for the details. Synopsis: "In a not-too-distant future, the United States of America has collapsed, weakened by drought, fire, famine, and war, to be replaced by Panem, a country divided into the Capitol and 12 districts. Each year, two young representatives from each district are selected by lottery to participate in The Hunger Games. Part entertainment, part brutal intimidation of the subjugated districts, the televised games are broadcasted throughout Panem as the 24 participants are forced to eliminate their competitors, literally, with all citizens required to watch. When 16-year-old Katniss’ young sister, Prim, is selected as the mining district’s female representative, Katniss volunteers to take her place. She and her male counterpart, Peeta, the son of the town baker who seems to have all the fighting skills of a lump of bread dough, will be pitted against bigger, stronger representatives who have trained for this their whole lives." I'm reading: Lionsgate Release Intense New "Countdown Event" TV Spot for 'THE HUNGER GAMES'!Tweet this!